Why do bacteria stick so well to plastic surfaces? Joanna Verran - If you don't mind I'll have to go back a little bit and talk about bugs on surfaces generally. 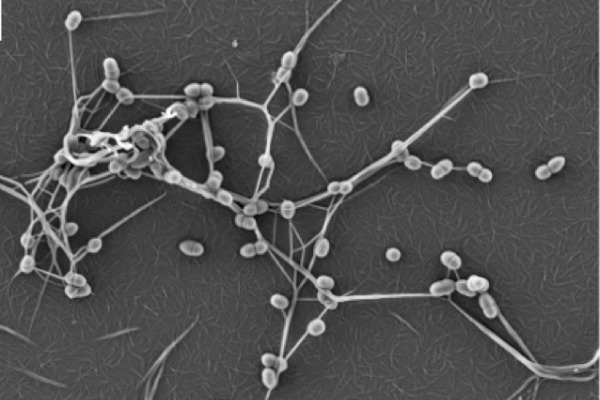 Bacteria generally on the planet live attached onto surfaces. Most of them are attached onto surfaces so it's where they would rather be. If you had bacteria in your mouth, if you swallow them they die but if they stick to your teeth it's much better for them. It's the best place for them to be attached to a surface. They'll stick to lots of different surfaces. In the food industry and where we've been talking about surfaces in hospitals you're just looking at survival of organisms that have stuck onto the surfaces. Perhaps they've been put there by people touching them or with the chopping board they've come into contact with a surface through the meat or whatever it is that's been chopped. That's a sort of contact and survival. The organisms haven't attached. They've just been put there and then they're surviving. We call that attachment at a solid air interface. If you allow the organisms to grow in a surface that's got liquid in it at a solid liquid interface we call that a biofilm. Again, although organisms are very happy to do that they'll stick onto a surface and then grow. In a roundabout way they'll stick on to anything really and it's trying to reduce their ability to stick. The other thing with biofilms - if you think about catheters or contact lenses or dentures - any sort of plastic that you might implant in the body. The first thing that will stick to those materials is organic molecules from the liquid around them. It might be saliva or tear fluid or urinary proteins. Then the bacteria will stick to those. The biofilm will form on top of that conditioned surface too. Previous Could laudanum treat superbugs? Next Will MRSA develop further resistance? Why do we use plastic materials so much in healthcare? Aside from the microbial attachment issue, our oceans are being filled with jettisoned plastic. There is good evidence that clinical touch surfaces made from copper alloys have dramatically reduced microbial bioburden, in busy hospital environments, between touches and between cleans. This translates to lower infection risk for patients and staff.